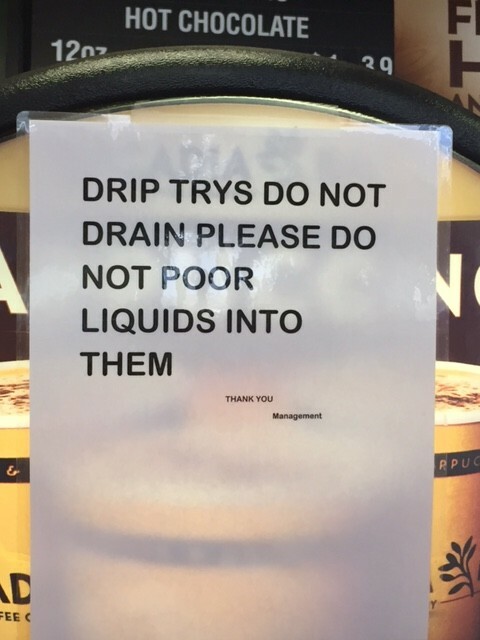 At a stop in Quartzsite, Arizona, on our way to Disneyland, I saw this sign on a drink fountain. There were several of the signs throughout the store on all of the drink dispensing fountains, so at least they were consistent. They were just consistently horribly wrong. Grammar Giggle – Do You Recogizne The Spelling Error? Comments Off on Grammar Giggle – Do You Recogizne The Spelling Error? This headline was in a local business paper and should have been easily caught if someone had actually looked at what they were typing. Grammar Giggle – Treat Our Customers . . . But Not To Good Grammar! Comments Off on Grammar Giggle – Treat Our Customers . . . But Not To Good Grammar! I saw this business card today and knew it was a Grammar Giggle. While it is a nice thought, it is an incomplete sentence. 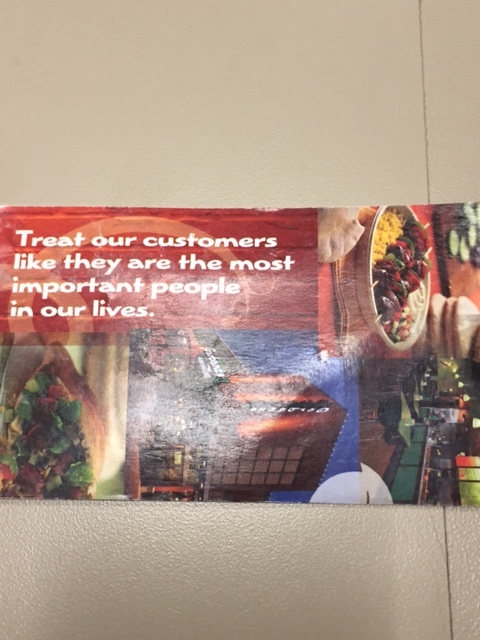 Do they want YOU to treat their customers that way or do THEY treat their customers that way. I’m all for saving space, but not to the detriment of your message. People ARE Paying Attention–Even Amphibious Pitchers! Comments Off on People ARE Paying Attention–Even Amphibious Pitchers! So many people sent this one to me that I feel compelled to write about it. This headline appeared in the East Oregonian this past weekend. It appears that although it was an Associated Press article, newspapers and other media outlets who reprint AP articles can change the headline to save space, etc. under their contract. So this tells us that the person in charge of laying out the sports pages of Saturday’s East Oregonian doesn’t know the difference between “ambidextrous”–the ability to use either hand as well as the other–and “amphibious”–the ability to work on land or in water. I’m sure lots of people don’t know that difference. The worst part is that the word “ambidextrous” appears in the actual article two words in on the second paragraph–close enough to the top that even I (a non-sports fan) might read that far. If you have even the slightest question about whether a word is correct, check it out. With online dictionaries a click away, it is inexcusable. 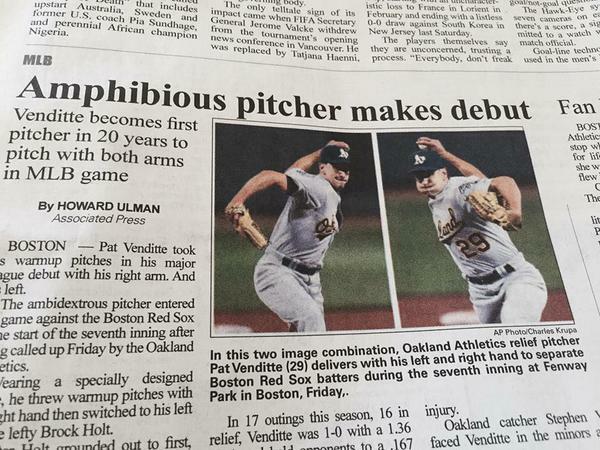 This story has spread like wildfire (a search of “amphibious pitcher” brings 158,000 results three days after the initial publication), so the East Oregonian unnamed confused employee has created quite a sensation. 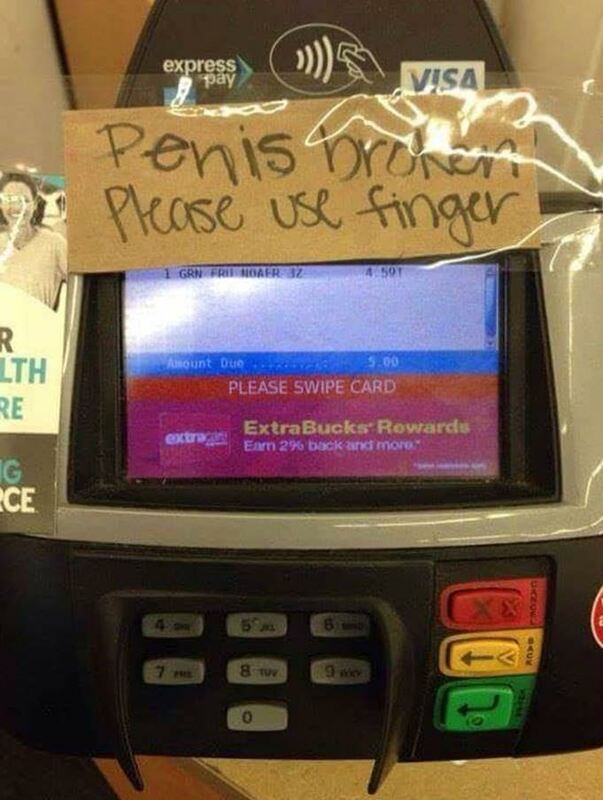 And I’m thinking not a very good sensation. Think about your first impression of the East Oregonian newspaper when you started reading this. I know I would not enjoy being the one responsible for such a “silly mistake.” At least that’s what the East Oregonian editor has to say about it. Silly? Yes. Inexcusable? Maybe. I know we all make mistakes–heaven knows I’ve made more than my fair share (and have stories to prove it! )–but for me, personally, I hold schools and media to a higher standard. LANGUAGE IS YOUR JOB! 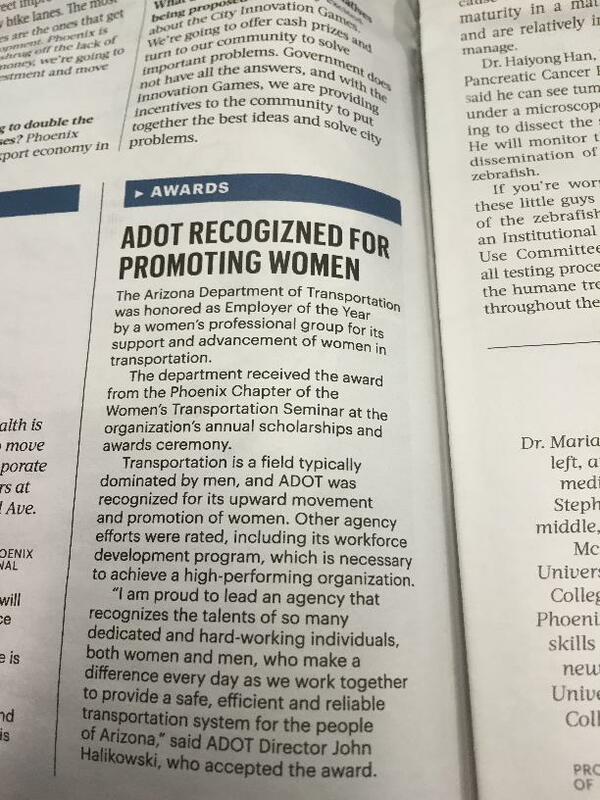 Of course, it is our job too. Slow down and take the time to get it right. If you have trouble with vocabulary, start reading! Most newspapers and books go through an editing process designed to make things as error free as possible. The more you read, the more your vocabulary improves. An even better practice is to look up words you don’t understand as you read them. Or sign up for a word of the day on most online dictionary sites and lot of other sites. Just do a Google search for “word of the day” and you will have lots of choices. That is a small thing that could make a big difference. Doing these things on a consistent basis can help you avoid the kind of “silly mistake” that can go viral and put your firm’s name out in the world in a way they hadn’t intended in a manner that is not at all flattering. Take the time your project deserves, concentrate on one project at a time (as much as that is possible), and produce work that is as error free as possible. “Silly mistakes” are for others who don’t work hard to make themselves and their firms look good. I embarrassed my husband by standing in the middle of the grocery store aisle to take this picture. Again, consistency is key. 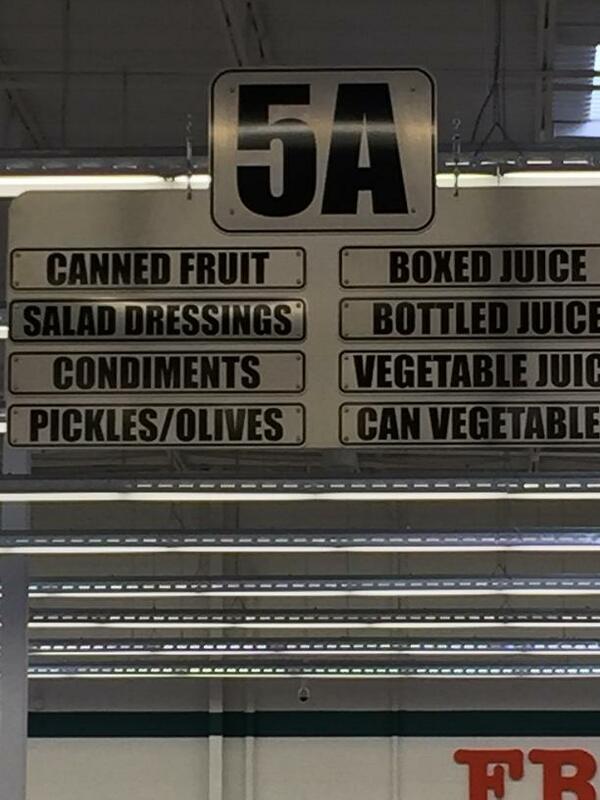 If you’re going to call them “canned” fruits (which is correct), then you should call them “canned” vegetables.